Marilyn Taft Thomas is Professor of Theory and Composition in the Carnegie Mellon School of Music. She is an active composer, author, educator, and arts leader. For the past twenty years, she has been unable to avoid leading various arts organizations, including the Headship of the Carnegie Mellon School of Music. Thomas has composed works for orchestra, choir, piano, voice, brass band, electronic media and chamber ensembles. Her music has been described in the press as "a strong, exciting musical statement," "very inventive," and "definitely of our century." 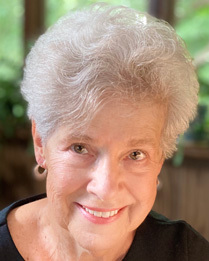 She has won prizes from the National Federation of Music and the National Harvey Gaul Competition, and has received nine awards in composition from ASCAP, with commissions from the Pennsylvania Council on the Arts, the McKeesport Symphony Orchestra, Carnegie Mellon University, the American Music Center, the Pittsburgh New Music Ensemble, and the River City Brass Band. 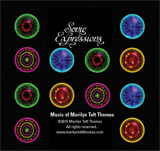 SONIC EXPRESSIONS is a CD collection of seven works composed by Marilyn Taft Thomas, performed by the Strings Music Festival Orchestra in Steamboat Springs, Colorado, Carnegie Mellon Philharmonic, Carnegie Mellon Wind Ensemble, McKeesport Symphony Orchestra, as well as faculty and students from the Carnegie Mellon School of Music. The CD was recorded in the Vlahakis Recording Studio, College of Fine Arts, Carnegie Mellon University. 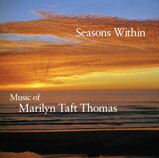 Seasons Within is a two-CD set of compositions by Marilyn Taft Thomas, performed by the Carnegie Mellon Philharmonic, Pittsburgh New Music Ensemble, Carnegie Mellon Contemporary Ensemble, and an impressive array of artist/faculty and alumni soloists. 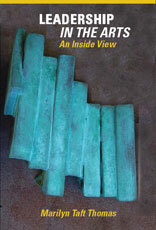 Leadership in the Arts: An Inside View is written for those who have headed an arts program, those who are presently doing so, those who think they'd like to do it, those who want to know more about the people who do this sort of thing, and for those who just need a good laugh.